Compatible with: usb charging devices such as Samsung, HTC, Xiaomi,etc. 1 x Charging Dock. 4-Port smart identifying charging. Phone holder function: 4 phones displayed on for charging simultaneously. Color: Black. Bamboo Charging Dock Station Charger Holder Stand Apple Watch iPhone iPad New. Condition is New. This stand works wonderfully to charge/hold your Apple Watch along with 2 phones. Made of a beautiful and sturdy bamboo this stand is a must have. Shipped with USPS First Class Package. Place the cell phones, tablet into the laying slots if you like. 1x Charging Station. Multiple internal protections, for the safety charging of the devices. Compliant to USB-Charging devices: For iPhone, For Sumsung, For HTC, For Xiaomi, For Huawei, For LG, etc. 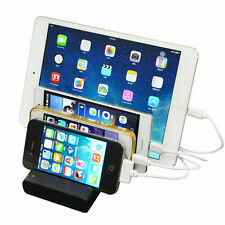 This item is an excellent 5 ports USB charging station which is universal for most phones and tablets. It is well made of premium material for durable and practical use. The unique design also ensures its popularity and practicality. PressPlay ONE Dock 4in1 Power Charging Station Apple Watch iPhone iPad. Color is gold. Excellent charger; works flawlessly. Must insert Apple Watch charger cable (not included). Additional USB Charge IQ ports on the back. Used but like new condition. $50 retail. Shipped with USPS First Class Package. Fits in your pocket and perfect for travel. Ergonomic, compact and portable design, much more space-saving and well-organized while charging your devices. Charging station has four (4) USB charging ports, including two (2) ultra high-speed charging ports. Phone & Tablet Charging Station. High-Speed USB. Ports : USB x 4 --. Color : White w/ Gray Surface --. Support Charging Up To 5 Devices Including Smart Phones And Tablets Simultaneously In a Compact Space. --Compatible with iPhone, iPad, Samsung Galaxy, LG, Nexus, HTC, etc. 30W, 5-PORT POWERFUL CHARGING STATION. The third port only for Android device,not for Apple device,other 4 ports are universal (Android &Apple both available ). it is normal that the LQ-DKC-001 maybe a litle warm while charging. Power input: AC 100V~240V, 50- 60HZ. For USB Charging devices such as iPhone, iPad, Samsung, LG and etc. 1 x Charging Dock. 4-Port smart identifying charging. Phone holder function: 4 phones displayed on for charging simultaneously. We might require you to send us photo/s of the item received and also your original item so we can compare and conduct necessary actions.